Over the years Trunk have worked with some amazing illustrators, including the likes of Pete Fowler, Rob Ryan, Peepshow Collective, Oliver East, and recently Mila Furstova. So when London based agency Homebrew called Trunk’s studio to ask if they could animate Anna Kovecses’s beautiful illustrations, the answer was a resounding yes! Both producer Richard Barnett, and director Layla Atkinson were already big fans of her work, and Layla had already stocked the studio’s library with Anna’s book ‘One Thousand Things’. The project was for Homebrew’s client, Rightmove, the UK’s largest property portal. In total we created two full length tv spots, a cut down and a 30 sec mobile piece. The two main spots were to promote the Rightmove “School Checker” tool and to promote the Rightmove site to potential tennants looking to let a property. The agency wanted a warm and charming style, full of colour and fun, and Anna, repped at Handsome Frank, was the perfect match. As Anna had never worked with animators before Trunk decided to meet with her to discuss the animation process. As her studio was based in Cyprus, (Oh no!) The guys were forced to leave a chilly London for sunny Larnaca in early February! Following the successful meeting a team of animators headed by Layla was pulled together in London to create the three shorts. 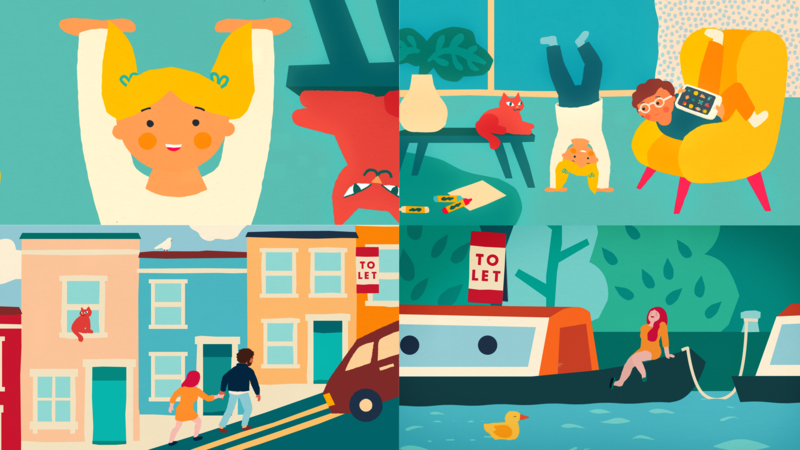 Animating Anna’s work was a treat and it was a real joy to see her bold and colourful illustrations come to life.